This article explores some of the key challenges retailers face in regard to the enterprise-wide management of data and marketing communications. Specifically, as retailers expand their suite of programs and promotional offerings to customers, their risk increases of issuing communications that are inconsistent, conflicting, ineffective or unwanted. 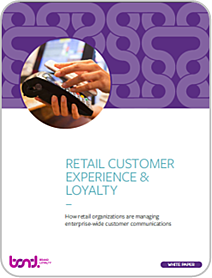 Retailers who send their customers communications from multiple stakeholders and programs need to establish integrated policies and systems to provide consistent customer brand interactions and meet the diverse needs of their businesses. Learn more about best practice approaches that will set your company up for success with your customers in your quest to forge more meaningful and avid relationships with them.